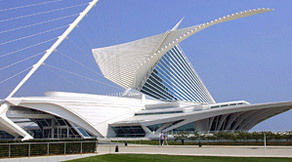 Quadracci Pavilion, Milwaukee Art Museum. Designed by Santiago Calatrava. Picture this: You’re watching the wings open on the Museum’s Quadracci Pavilion and you realize you hear music… Ever wonder who is behind its creation? I have! The answer is the talented Kris Martinez, Interactive Designer at the Museum. Below, straight from Kris, is everything you ever wanted to know about the music of the Museum. My name is Kris Martinez, and I am an Interactive Designer at the Milwaukee Art Museum. Some of my daily tasks include designing websites for our feature exhibitions, creating interactive installations, and creating television commercials. I also compose musical themes for the Museum. For the past year, the Museum has featured short musical pieces that play when the wings open and close. This happens three times a day: 10 AM when the Museum opens, noon when the wings flap, and 5 PM (or 8 PM on Thursdays) when the Museum closes. Each arrangement is unique and is inspired by the Museum’s feature exhibition. Originally, the themes were meant to provide the soundtrack to our television spots. We started with European Design Since 1985: Shaping the New Century, which was tough for a few reasons. The tagline for European Design was “I am not just an object.” In the spot, each object enters the frame individually and solicits our attention, suggesting that we are treating them as objects and neglecting them. In this instance, the challenge here was to create something modern, uplifting, and charming to personify each object and speak to the viewer. There was also a bit of tongue-in-cheek melancholy to provide a sense of compassion that we were overlooking so many of the things that compete for our attention. The final spot had no voiceover until the end, and relied on the text, soundtrack, and innate characteristics of each item to direct the mood. Above: The TV spot for European Design Since 1985. Frank Lloyd Wright: Organic Architecture for the 21st Century followed European Design, and was when we decided to feature special music as the wings moved. Creating a new, relevant theme for each exhibition is both challenging and very rewarding. The Museum features a wide variety of special exhibitions, so each theme requires a unique approach and becomes a learning experience. My goal is to match the tone and feel of the exhibition, and I pull in as many assets as I can in order to reach that goal. For instance, an artist’s medium, technique, color palette, and—in Wright’s case— personality have all been used as resources when creating a soundtrack. Above: The audio for the Frank Lloyd Wright exhibition. Research is also an important aspect of the process in order to capture and understand the historical context of the exhibition. I believe this is most apparent for Impressionism: Masterworks on Paper. For this exhibition, I originally wrote several pieces inspired by the works of Debussy and Ravel. However, I ultimately ended up performing a version of Claude Debussy’s “Clair de lune”. This movement was chosen for its historical relevance to the impressionist art movement, as well as its familiarity outside of the art world. Listeners may have heard this particular piece used elsewhere, and hopefully understand that it has a historical relevance that is connected to artists like Monet and Renoir. Above: The audio for the Impressionism exhibition. My personal favorite themes so far have been for Summer of CHINA. The music was meant to sound great, powerful, sweeping, and dramatic in order to reflect the characteristics of the Forbidden City. It also gave me the opportunity to work with instruments and melodies that I had not used before. I enjoyed it so much that I created two different themes that were used during the run of the show. Above: The TV spot for the Summer of CHINA exhibitions. Above: The 30 second audio clip for the Summer of CHINA exhibitions. My most recent project involves creating a theme to replace what the Museum currently plays between special exhibitions. The current fanfare has been playing since the Calatrava addition opened and I was asked to provide an update. Fortunately, the building is a work of art in itself, and has several unique characteristics to work with. Many words come to mind when describing the building: clean, graceful, elegant, delicate, peaceful, and modern. These keywords help inspire me to create a piece that reflects the same qualities in order to accentuate the spectacle of the wings. It is exciting to know that thousands of people from around the world visit the Milwaukee Art Museum, and that my small contribution adds to the overall experience of watching the building move. This entry was posted in Behind the Scenes, Exhibitions and tagged "The Wings", Behind the Scenes, European Design Since 1985, Frank Lloyd Wright, Impressionism, Music, Quadracci Pavilion, Santiago Calatrava, Special Exhibitions, Summer of CHINA. Bookmark the permalink. I am very impressed with this young man!